Calling all Chicagoland nearly-weds! This is a giveaway not to be missed. 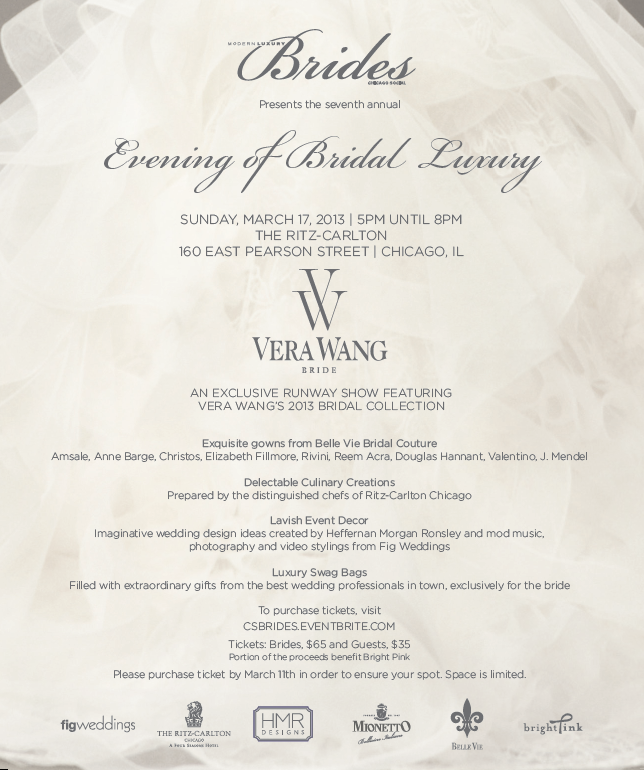 Our friends at Chicago Social have given us complimentary VIP passes for their Evening of Bridal Luxury on Sunday, March 17, 2013 at the Ritz-Carlton, 160 East Pearson Street in Chicago, Illinois. Four lucky winners will win a VIP pass (each a $100 value!) good for complimentary admittance for the bride and her guest. Attendees will enjoy a Vera Wang 2013 Bridal Collection Runway Show, delectable culinary creations and lavish wedding décor inspiration. Each bride will receive a luxury gift bag filled with extraordinary items from Chicago wedding professionals. This special event is presented by Chicago Social Brides. Purchase tickets to the event by clicking here. Enter for your chance to win one of our VIP passes via the Rafflecopter form below. Winners will be announced and contacted by email March 8th, 2013. Good luck!